Dental implants can be used to help improve the support, stability, and retention of complete and partial dentures. At Lesniak Dental Group, our implant dentures are completed by a registered specialist in prosthodontics - Dr. Robert Lesniak. Prosthodontists are the experts in replacing missing teeth having completed dental school and an additional three years of specialty training. Dr. Lesniak is skilled in the full range of implant dentures in both surgical and prosthetic aspects. Please visit: www.drrobertlesniak.com for more information. Several different treatment options are available for implant dentures. Within each category there are a multitude of possible treatment options, Dr. Lesniak is happy to review these in detail with you. Implant assisted complete dentures combine complete dentures with implants. The key feature of this treatment is the dentures remain removable by the patient to facilitate both home hygiene and repair if needed. 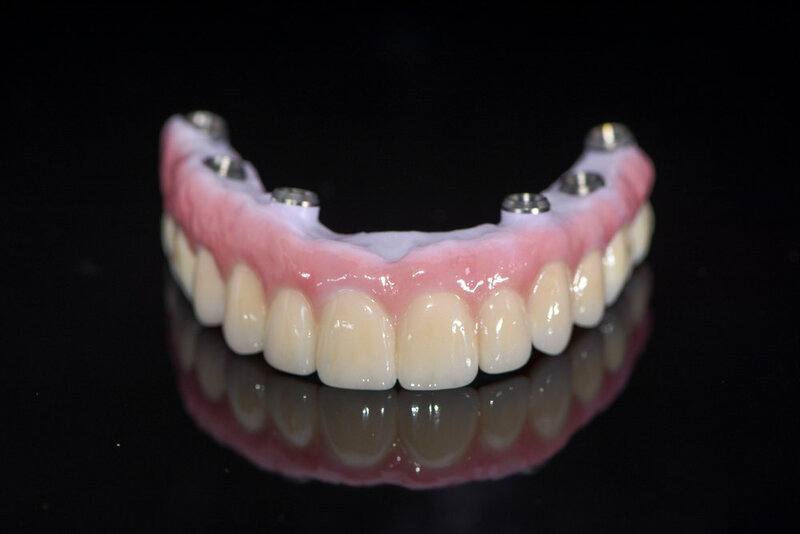 Based on the number of implants, these removable implant dentures can be fabricated to have some movement, to no movement at all functioning with perfect stability. Generally, 2-6 implants are required for implant assisted complete dentures. A fixed implant denture is secured in place and is not removable by yourself at home. These fixed dentures can be removed by a trained dental professional for maintenance and repair as needed. These options are ideal for the patient who cannot, or will not tolerate a removable denture. Generally, 4-8 implants are required for fixed implant dentures.